(The author’s note: The account given here is a very short summary of the facts drawn from my published books. Deeper and broader presentations and discussions can be found in my books). Myanmar, with her rich cultural and natural resources, has every potential to be a world leader that everybody will love. However, to my anguish: With hate ideology and violent persecution of the Rohingya people, Myanmar has now entered into the darkest era of human civilization in the post-WWII. Based on the 1990 Myanmar election data, I calculated in my book The Price of Silence (2005), p 252, that there were 1.87 million Rohingya in a total population of around 4 million in the Rakhine State, in 1990. Today, based on the latest United Nations and media reports as of September 29, 2017, Rohingya exodus passed half a million mark at 501,000, in addition to earlier mass exoduses since 1978. As such, there is left less than 500,000 Rohingya inside Myanmar. That means more than 73% of Rohingya population has been forced out of Myanmar. Beyond doubt, this is ‘ethnic cleansing’. In the statues of International Criminal Court (ICC) and the International Criminal Tribunal for the Former Yugoslavia (ICTY), the ‘ethnic cleansing’ is defined as a ‘crime against humanity’ and depending on the severity it may amount to genocide. In spite of the obvious brutal scorched-earth criminal activities of the Myanmar authorities, it is saddening to see that certain powers are putting blame on ‘Rohingya,’ as the central cause of the crisis, asserting that ‘Rohingya’ is a political construct of the Bengali illegal immigrants to gain a hold in Myanmar. At the same time, undue supports to the Myanmar authorities are being showered by certain powers with the hope of getting a mega slice of Myanmar natural resources and economic benefit. Rohingya Mayu region is rich in gas, oil, and coal. Under such global attitude of greed for power and money, how shall a common man like me go against the world powers, against the socio-economic currents, and fight for justice in this case of Myanmar’s crimes against humanity? At least, with the hope that, one day, there will be an international tribunal for Myanmar crimes against humanity, I can try to tell the factual story with a presentation of the Rohingya cultural anthropology, which constitutes a strong antithesis of the Myanmar hate ideology. A legend is a tradition or history based on the actual event, extraordinary in nature, in a distant past, whereas a myth is purely a make-to-believe imaginary fictional story. Let us see. Myanmar accuses that Rohingya is a political construct of the Mujahideen in 1958 in light of the absence of the word “Rohingya” in the existing Myanmar historical records. However, upon a careful examination, I find that the existence of Rohingya is manifested in the Rakhine chronicles by the Rakhine historians themselves, such as Rakhine Maha Razawin by Saya Me, written in 1840. The first book on Myanmar (Burma) history by a non-Burman is History of Burma by Sir Arthur Phayre, published by Trübner & Co., London, in 1833. This is the earliest and most reliable recorded history of Burma written by a person who had long experience in Arakan and Myanmar from 1824 to 1867 as a soldier, diplomat and governor. The following is his description of Arakan. “The country known in Europe as Arakan extends for 350 miles along the eastern shore of the Bay of Bengal. It is called by the natives Rakhaingpyi, or land of the Rakhaing. The same word in the Pali form, Yakkho, and also Raksha, is applied to beings, some good and some bad, who have their abode on Mount Meru, and are guards round the mansion of Sekra or Indra.” (Sir Arthur Phayre, History of Burma, 1883, p 41). This is a legend but not a myth. The Myanmar version of Mt. Meru is Mt. Mayu. In Burmese dialects ‘e’ and ‘a’ sounds are indistinguishable and ‘r’ is pronounced as ‘y’, like ‘Yangon’ for ‘Rangoon’. Now, it is a striking coincidence that we have the Rohingya people in the region along the ridge, east and west, of Mt. Mayu, in Arakan. “Rohingya” is a derivative of the Sanskrit word “Raksha” whereas “Rakhine” comes from the Pali version “Rakkha.” (For more detail consult The Rakhine State Violence, Vol. 2: The Rohingya). It is also possible that the term “Ra-khine-thar” simply is a Burmese transliteration of “Ra-k-sha.” The words mean a guard or soldier in English. They are the soldiers who guard Mt. Meru, the abode of King Indra of Heaven. The oriental cosmology with Mt. Meru as the center of the universe is the mainstay in Myanmar culture. In Burmese literature, Mt. Meru is popular as Myint Mohr, Myint for Mount and Mohr is the direct adaptation of Devanāgarī Meru into Burmese script. While Mt. Meru is an object of belief, Mt. Mayu in Arakan is a reality. Indeed, we do not know when or who gave the name. When I try to connect the dots in the “out-of-African” human migration that gradually populated the world, it makes me ponder when I find that Mt. Meru also exists near the Tanzanian Olduvai Gorge, the famous archaeological site of human evolution, where the fossils of the early human species Homo habilis, Paranthropus boisei, Homo erectus, and Homo sapiens have been found. In the midway of Tanzania and Arakan, another Mt. Meru stands in Garhwal Himalayas of the Uttarakhand region, India. In Arakan, it is a fact bigger than reality to find Mt. Meru, or Mt. Mayu in Burmese, is guarded by the Rohingya of Raksha descent. Raksha or ogre is the identity given to the native dark skin people by the invaders of light skin color. A similar scenario can be found in Sri Lanka history of the invader Prince Vijaya and the native ogre woman called Kuveni. Therefore, it is sound to conclude that the term “Rohingya” is not a myth of 1958 political construct by the then Mujahideens, but a legend embedded with facts and recorded in the Rakhine chronicles written by the Rakhine themselves. 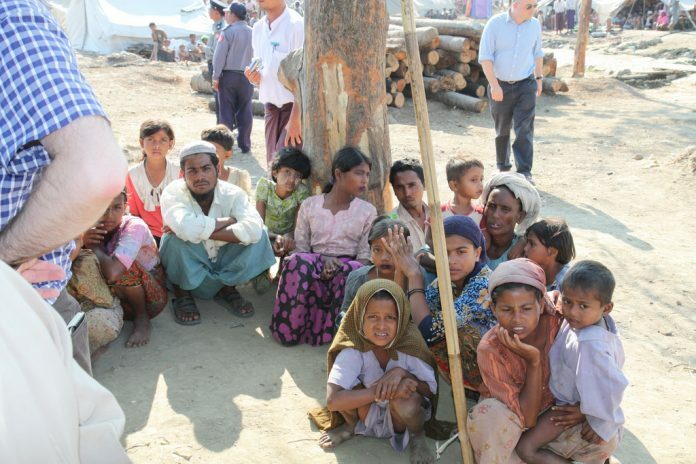 Then, the question arises: who are the Rakhine? The legendary aboriginality of the Rohingya is supported by the Rakhine’s claim that they are the descendants of the conquerors and the indigenous people. Most distinctly, the most famous and prominent Rakhine intellectual, aristocratic politician and Barrister-at-law, U Kyaw Min (ICS, MP), who was one of the elite eight Indian Civil Service (ICS) of all British Burma, and a Member of Parliament (MP) from 1950 to 1962 in the independent Burma, representing the Rakhine political party known as Ratanya (Arakan National United Organization), asserted that “the Arakanese people are of Aryan stock mixed with the indigenous people who have inhabited Arakan from time immemorial,” in his extremely popular pamphlet The Arakan State, the Pye Daw Tha Press, 1958, see page 1, Mistaken Belief. He wrote it in a serious rebuttal to the Burmese assertion that the Rakhine are also the Burmese who have acquired some distinct characteristics due to localization for a long time. The Rakhine being the descendants of the Indo-Aryan stock is the well-accepted Rakhine legend. Every Rakhine will proudly say as such, regardless of his or her biometric phenotype. How come? A satisfactory answer came from another famous Rakhine intellectual U San Tha Aung, who was a professor of physics, and became the Vice Chancellor of Rangoon University and then the Director General of Higher Education in the days of Ne Win’s regime. In his famous book The Buddhist Art of Ancient Arakan, Chapter 1: Geographical Description, Subheading: The Peoples of Arakan, he wrote, “The earliest people who lived in Arakan were Negritos who are mentioned in the chronicles as “Bilus” (cannibals). They appear to have been the direct neolithic descendants of the Arakanese soil. Later, waves of peoples of different races came into this land from the north.” Based on the legends of First Dhannyawaddi Kingdom recorded in the Arakanese chronicles, it is possible that the Indo-Aryan peoples of Northern India conquered Arakan in an ancient past, most likely in the days of Great Mauryan Empire 322 to 187 BCE. The first king of Dhannyawady Kingdom was Marayu, which is a corruption of Maurya. In this regard, I must say that the Rakhine historians placing of the King Marayu in 2600 BCE is a mysterious error. The language of the Mauryan Empire was Magadha. This is the reason why the Rakhine people say that everybody spoke Magadha in the old days and now, only the birds do so. U San Tha Aung believed that the Magadha-speaking Rakhine were known as Magh or Mogh by the people of Bengal. Up to today some Bengali and Rohingya call the Rakhine Mogh. However, they say a ‘Mogh’ means a ‘pirate’, referring to a period of the Portuguese and Rakhine pirates operating in the Bay of Bengal in the early 1600s. I agree with U San Tha Aung since the term Magh or Mogh existed much earlier than the age of the Portuguese pirates. Again, in support of the Magadha origin, the scholars also know that a Bengali poet named Daulat Qazi who served the Rakhine king Thiri Thu-Dhamma Raja (r.1622-1638 CE), in his epic poem ‘Satî Mainâ’, mentioned Magadha descent of the king and his kingdom as follow. City by name – like the Heaven. Name being Sri Sudhamma Raja, renown for his justice. Grooms the subjects like his own children. It is important note that the 17th-century poet of the Arakan Palace, Daulat Qazi, used the word ‘Roshang’ but not ‘Rakhine’. Now, the Rakhine also claim that they are also the descendants of Rakha (Rakkha) or Bilu. Rakkha is the Pali version of the Sanskrit word “Raksha.” Sanskrit is an earlier language than Pali. Therefore, it is reasonable to accept that the Pali version Rakkha became prominent when the ancient land of Arakan was conquered around 322 BCE and ruled by the Mauryans who spoke Magadha, a Pali language. Both U Kyaw Min and U San Tha Aung clearly believed that the Rakhine are the descendants of the conquerors, the Magadha-speaking Mauryans, and the indigenous people. As such, they came to be known as the Rakhine in Pali version. In light of these statements, it is reasonable to believe that the Sanskrit version ‘Rohingya’ and the Pali version ‘Rakhine’ diverged beginning at the time of the Mauryan rule of Dhannyawady Kingdom. So must also be the Rohingya, the natives, and the Rakhine, the children of the conquerors married to natives. Maurice Collis was a British Commissioner of Arakan and his knowledge of Arakan is formidable. He is in agreement with Professor Daniel George Edward Hall, who was the founding father of the Department of History at Rangoon University in 1921. Professor Hall wrote in his book, A history of Southeast Asia (1964), that Burmese arrived at Arakan only in the 10th century AD and the earlier kingdoms of Arakan belonged to the Indians “ruling over a population similar to that of Bengal.” Again, these historical events are supported by another prominent scholar, Randy J. LaPolla, who is currently a Professor, at the Division of Linguistics and Multilingual Studies, Nanyang Technological University, Singapore. He wrote, “The people we have come to think of as the Burmese had been in Yunnan, under the control of the Nanzhao kingdom, and moved down into Burma beginning in the middle of the ninth century.” (See p. 237 of Randy J. LaPolla, The role of migration and language … Case Studies in Language Change, Oxford University Press, November 2001). According to him, the Burmese established themselves by conquering the Pyu and the Mon. Later, they conquered Arakan. Since then, the Rakhine has been under the influence of the Burmese. Consequently, the Rakhine today speaks a dialect of Burmese and, indeed, the Burmese blood also runs in them. As such, the Rakhine are a mixed population of the aborigines Negritos, Mauryans who are the Northern Indo-Aryans, and the Burmese of Yunan origin. That is why you will find many skin color shades, from black, yellow, golden to snow-white, among the Rakhine. I can see these beautiful phenotypes in my clan. I came from a large and well-established clan whose forebears founded and ruled Laymro and Mrauk-U dynasties from 13th to 18th century. I have relatives and distant relatives throughout Arakan spanning from Bandarban and Cox’s Bazar area of Bangladesh to Taungup and Gwa area of Rakhine State, Myanmar. I came to realize this amazing genetic diversity when I learned Mendelian inheritance laws and Punnett Squares at Rangoon University and I am proud that I am a Homo sapiens having a rich gene pool, though I am not a tall, dark and handsome man. Similarly, today Rohingya are no longer the Raksha of the ancient days. Their gene pool has been enriched by the waves of new settlers in the days of the Arakan Empire as described by the famous poet Alaol in his epic poem, Padmavati (1648). It will be naive to say that there is no Bengali in Arakan. Based on the commonness of mtDNA macrohaplogroup M in both Bengal and Myanmar, a very similar, if not the same, the population must have lived in both regions some 10,000 to 40,000 years ago. Thousands of years passed and Professor DGE Hall, based on the archaeological artifacts, found evidence that before the Burmese occupation in the 10th century Arakan had a similar population to that of Bengal. We must keep in our mind that what we now know as Bengal and Burma (Myanmar) took their respective politico-cultural shapes only in the 12th century. Accordingly, the first recorded Bengali settlers in Arakan are the soldiers of Sultan Jalaluddin Muhammad Shah of Gaur, then the capital of independent Bengal, who were given to the dethroned Rakhine King Mun Saw Mwan, to restore his throne from the Burmese occupation in 1430 CE. The Burmese hatred towards the Bengali probably began here. The number of soldiers described by the scholars varies from 30,000 to 50,000 but we do not know how many stayed on. We do know that a good number of the Bengali soldiers served the Rakhine kings of Arakan from 1430 to 1784. The Rakhine kings ruled the twelve cities of Bengal, including Chittagong for 150 years. Many captives from the occupied areas were forced to slave-labor in the paddy fields of the Rakhine kings as witnessed and recorded by the Portuguese Augustinian friar Sebastião Manrique’s in 1628. With the help of the Bengali and with the revenues and exploits from Bengal, Arakan prospered. Even the most famous king of Arakan Min Bin (r.1531-1553) had Bengali queens as noted by Professor Pamela Gutman in her book Burma’s Lost Kingdoms: Splendours of Arakan (p. 100). As such, even the Rakhine royals carried the Bengali genes. In the course of time, they all became Arakanized and mostly settled in the central Arakan, not in the northern Arakan. Their descendants prefer to be known as the Rakhine Muslims. Again, R.B. Smart on the page 90 of his report wrote, “They (Mussalmen) differ but little from the Arakanese except in their religion and in the social customs which their religion directs; in writing they use Burmese, but amongst themselves employ colloquially the language of their ancestors. Long residence in this enervating climate and the example set by them, the people among whom they have resided for generations, have had the effect of rendering these people almost as indolent and extravagant as the Arakanese themselves.” This I know because I had Muslim friends in my school and university days and about 10% of them, with trust, confided me that they were the descendants of these Arakanized Bengali and that they had Rakhine father or mother in their family tree, and therefore they are also the ‘Rakhaingthar’ or ‘Roshangya’. This is the reality of cultural anthropology brought about by the Arakan Empire and, naturally, we must accept its manifestations in every aspect. Most of the Arakanese Muslim soldiers were killed, along with their Arakanese Buddhist comrades in defense of Arakan against the Burmese occupational war in 1784. During the Burmese genocidal occupation of Arakan from 1784 to 1824, some 250,000 Arakanese people (The Price of Silence (2005), p 244), both Buddhists and Muslims, were killed and more than 100,000 were enslaved by the Burmese kings either as the forced labor to build the pagodas (e.g. Mingun), and water reservoirs (e.g. Meiktila Lake), or as the conscripts in their fight against Siam (now Thailand). Near the Thai border, a southern Burmese community known as the Beik-thar (also known as Myeik) is made up of the descendants of the Rakhine soldiers who settled there during the Burmese-Siamese Wars (1785-1812). They still speak Burmese with distinctive Rakhine accent. Many Arakanese Muslims were forced to dig Meiktila Lake and they are known as the Mye-du (Muslim), meaning earth-diggers. Today, they live in or around the city of Meiktila and suffered a serious attack from the Buddhist extremists in 2013. At the event of the 1784 Burmese genocidal occupation of Arakan, the people of Arakan (Arakanese), including Buddhists, Muslims, Hindus, and animists, fled. Later, many more fled from the brutality of the Burmese occupational forces. Again, more people fled from the First Anglo-Burma War (1824-1826). Most of them returned to Arakan when the British occupied it in 1826. The return of the Arakanese Buddhists, Hindus, and animists are viewed as the return of the natives by the today Burmese authorities, but the return of the Arakanese Muslims is considered as the Bengali infiltration and they now face the ethnic cleansing. Therefore, we must carefully review the historical records. Two very important reports are discussed here. The emphasis in italics are mine. As per British record (B.R. Pearn, King-Bering, Jour. Burma Research Soc., Vol. XXXIII (II), 1933, p445), is that “by the year 1789, two-thirds of the inhabitants of Arakan were said to have deserted their land.” Please note the term ‘the inhabitants of Arakan,’ which carries the meaning that all communities of Arakan, fled into the British territory in Bengal and India. The British Deputy Commissioner, R.B. Smart in his report (Burma Gazetteer Akyab District Volume A, Rangoon, Superintendent, Government Printing, Burma, 1917, p 84) wrote, “When Arakan was first ceded it was found to be depopulated but immigrants soon flocked in, composed mainly of persons who had been driven out by the Burmese or who escaped during the war and who came back to their homes from Chittagong and other neighboring districts, and as the country became more settled the immigration increased.” Arakan was ceded by the Burmese to the British in 1826 when the Burmese were defeated in the First Anglo-Burma War, 1824-1826. The Deputy Commissioner Smart’s elaboration that “the immigrants” are “composed mainly of persons who had been driven out by the Burmese or who escaped during the war” is the critical information we must bear in our minds in every page when we read his report. It is imperative to do so. Deputy Commissioner Smart used the word ‘immigrants’ for all returnees. In the later sections of his report, his use of the word ‘Arakanese’ only for the ‘Rakaing’ (i.e. Rakhine) is arbitrary since the word ‘Arakanese’ is a derivative of the name of the country ‘Arakan’ and as such it covers all inhabitants of Arakan. He also generalized in the use of the word ‘Chittagonian’ for the ‘Arakanese Muslims’, and ‘Chittagonian Hindu’ for the ‘Arakanese Hindu’ for the simple reason that they all came from “Chittagong and neighboring districts” where they had been exiled during the Burmese occupation (1784-1824) and the First Anglo-Burma War (1824-1826), for more than 40 years. Many of them must have been born there. Therefore, in the eyes of the British who effectively ruled Bengal since 1765, they were all Bengali or Chittagonians. Furthermore, R.B. 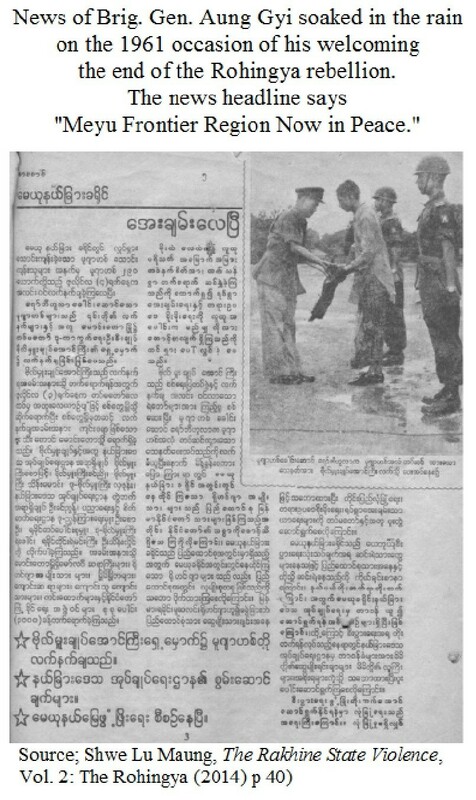 Smart on the page 89 of his report, clearly mentioned that the Mahomedans “were, for the most part, descendants of slaves captured by the Arakanese and Burmese in their wars with their neighbours.” As such, the word ‘Chittagonian’ in his report is a much-generalized term for the convenience of reporting. At the same time, Myanmar’s assertion that all ‘returnees’ were the Rakhine only does not reflect the historical reality of Arakan. We must be fully aware of the fact that the Arakan Kingdom was multi-ethnic and multicultural, as recorded by the famous Bengali poet Alaol in his epic poem Padmavati, written in 1648. Alaol served in the royal palace of Rakhaing kings Narapadigyi (r.1638-1645 CE), Thado Mintar (r.1645—1652 CE), and Sandathu-dhamma (r.1652-1684 CE). In his description of the multi-ethnic and multicultural society of Arakan, which is given below, I counted 41 ethnic groups. As such, when we read carefully various historical accounts it is clear that Arakan was a multiethnic and multicultural and that the settlers at various phases of Arakan’s history intermarried with the local people. In particular, the multiethnic and multicultural diversification, as well as the melting or intermixing, took place in central Arakan, far away from the Mayu region. The mixed descendants are also known as the Roshangya that changes into Rohingya in the course of time. This may seem to complicate the scenario because we now have a second layer of Rohingya. Nevertheless, the second layer of the Rohingya does not compromise the aboriginality of the Rohingya; rather it enriches the Rohingya culture and gene pool. Notwithstanding, the second layer of Rohingya was a making of the Rakhine people, their kings, and the Burmese conquerors, and consequently the responsibility devolves onto the Rakhine and their master, the Burmese. Therefore, Myanmar today must handle the Rohingya issue with a sincere sense of due responsibility. Let us not forget that, in the 17th century, Poet Alaol, like Daulat Qazi, also referred Arakan as Roshang, which is the direct derivative the Sanskrit word ‘Raksha’. Therefore, it is obvious that Arakan was also known as Roshang and as such, the ‘Roshangya’ or later ‘Rohingya’ are also Arakanese. In the later days, due to the racial and cultural divergence, the Arakanese Buddhists prominently became ‘Rakhine’ with Pali inclination and the Arakanese Muslims remain as ‘Rohingya’ having Sanskrit lineage. With the event of the Buddhist dominance, in particular, after the Burmese genocidal occupation of Arakan in 1784, the ‘Rohingya’ faded into the unknown place of history. The Buddhist dominance gradually advanced to Buddhist ultra-nationalism or Myanmarism, which is a hate ideology, (see The Price of Silence. ISBN-13: 978-1928840039, 2005), resulting in ethnic cleansing, with the event of General Ne Win’s fascist militarism in 1962 and his racist Citizenship Act of Burma, 1982. Why is Myanmar still acting as the occupational force? Why is the world tolerating such crimes against humanity? This is 2017, not 1784. A study of the linguistic scenario also renders strong support to the abovementioned legends and history of Rohingya aboriginality, elucidating that they are neither Bengali nor Burmese. It has been established that the Rohingya is a dialect within the Indic (Indo-Aryan) languages of Indo-European language phylum. Therefore, it is native to South Asia as per today’s geographical classification. Burma is included in the Southeast Asia. However, if we look at the map, says the Google Earth, we can easily see that Arakan of Burma is more of South Asia than of Southeast Asia. As a matter of fact, I have concluded that Arakan or the ancient legendary Rakkhapura was an extension of the Brahmaputra Civilization (p 223, The Rakhine State Violence, Vol. 2: The Rohingya). Therefore, it is reasonable to conclude that the Rohingya speakers are indigenous to the region. On the other hand, the Rakhine language is an archaic dialect of today’s Burman language, which is classified as the Tibeto-Burman branch of the Sino-Tibetan phylum. According to Professor Randy J. LaPolla, a distinguished scholar of linguistics the Sino-Tibetan language was originated in the Yellow River valley of China some 6,500 years ago (p 99, The Rakhine State Violence, Vol. 2: The Rohingya). As such, it is clear that the Tibeto-Burman speakers of Myanmar are the emigrants from north China. This squarely invalidates the assertion by the Myanmar scholars and authorities that Myanmar is a native land of the Tibeto-Burman speakers. Furthermore, a Sino-Burmese scholar named Chen Yi-Sein who taught at Rangoon University and was a member of the Burma Historical Commission from 1956 to 1987, identified the Pyu of Taungdwingyi, central Burma, being the Dravidian speakers, contradicting the popular version that the Pyu were the Tibeto-Burman speakers. Current scholars like Michael Aung-Thwin, the University of Hawaii at Manoa, has described that the Pyu musicians entertained with Sanskrit songs at the Tang Court in 800–802 as per the Chinese records. Pyu scripts are based on the Southern Indian Brahmi scripts. The artifacts found in various Pyu archaeological sites, dating from 1st to 9th century CE, were written in Pyu, Sanskrit or Pali. In addition, from the available archaeological artifacts, we have good reasons to believe that Pyu belonged to the same stock of South Asian people such as Tamil. The native people of Taungdwingyi and Prome (pyay) region have dark skin color and the girls are popular as ‘nyochaw’ or ‘brown beauties’. Burmese chronicles also mention that two blind Princes of Tagaung were cured to regain their eye sights by an ogre-nymph in the region of Shinma-daung and Mt. Popa, at the bank of Irrawaddy River. The ogre-nymph is, for sure, a dark-brown Dravidian speaking lady. The names, Mt. Popa (Puppha) and River Irrawaddy (Iravati) are not of Tibeto-Burman but are of Indic and Dravidian origin. In parallel, it is well-established that the Mon of Mon-Khmer people were in Burma long before the arrival of the Tibeto-Burman speakers. The Mon-Khmer language is in the family of Austroasiatic language phylum. In addition to the Mon, the languages of the Palaung and the Wa of Myanmar also fall in the family of the Austroasiatic languages. There was no mentioning of Rakhine in Vesālī Ānandachandra Sanskrit stone inscription. The word Rakhine (Rakkhaing) first appeared only in the 14th-century literature known as Shin Nagainda Mawgwun, an epic poem. It says they are known as the Rakhine (the guardians) because they safeguard two faculties such as Amyo (kindred) and Sila (religion). The Burmese script first appeared along with Pali, Pyu and Mon scripts in the Myazedi Stone Inscription made by Prince Raza Kumar of Pagan (Bagan) in 1113 CE. And it is believed that the Myanmar scripts were invented based on the Pyu scripts. As such, among the major languages and scripts, the Burmese language and scripts are the last to appear in Burma. Today, the Rohingya language is unique with its own features within the Indo-European language family. It is also important to know that the Rohingya language is not legible to the Bengali and vice versa; however, a Rohingya can understand the Chakma language and vice versa, as pointed out by Dr. Muhammad Firdaus, M.D., FACP, an American physician of Rohingya ancestry, in the USA. As such, there is some affinity to each other between the Chakma and Rohingya languages. This intrigues me because Marayu, the founding king of Dhannyawadi is recorded to be the son of a Chakma woman and a Mauryan prince (The Rakhine State Violence Vol. 2: The Rohingya, pp 89-90). For sure, the Rohingya is not a Bengali dialect as concocted by the Myanmar authorities. Accordingly, we must reject the Burmese wrongful alienation of the Rohingya by calling them Bengali just because they speak an Indic but not a Tibeto-Burman dialect. Finally, we must, with all due justice, respect the uniqueness of the Rohingya and its own identity, independent of Bengali and Burmese. Thereby, we must honor their rights to self-identification and self-determination. Today, no evidence is complete in the absence of genetics and DNA technology. There are two distinct lines of genetics inheritance, one from the mother and the other from the father. We can follow the genetic trail by tracing the genetic markers known as the haplotypes and those having the same haplotypes are grouped into the haplogroups. The genetic materials known as the mitochondrial DNA or mtDNA is uniquely inherited from the mother only. Therefore, from the studies of the mtDNA, we can trace the origin of our maternal ancestry way back to the remote time of human evolution. In light of present knowledge, it is established that our Mitochondrial Eve lived some 194,000 years ago, possibly somewhere in East Africa, and she carried the macrohaplogroup L. The mother macrohaplogroup L branched out to L1-6 macrohaplogroups. It would appear that the early human who had mtDNA macrohaplogroup L3 came out of Africa probably some 94,000 years ago. From the macrohaplogroup L3 emerged the macrohaplogroups M and N, as early as some 62,000 years ago. All the European population carries the macrohaplogroup N whereas the Asian population, from the Indian Subcontinent, Southeast Asia to Far East, has the mcarohaplogroup M. The mother’s mtDNA is a better indicator of the aboriginality of a local group because it is men who usually migrate or invade. For example, from the studies of Venezuelan population genetics, we know that all the paternal Y-chromosome comes from almost exclusively of the European invaders while the maternal mtDNA is purely of the indigenous women, indicating that the indigenous males were wiped out. In a study of 44 complete mtDNA sequences of Myanmar people by M. Summerer and his colleagues (BMC Evolutionary Biology, 2014, 14:17, pp 1471-2148) they found that all Burmese mtDNA fall in the macrohaplogroup M. Most interestingly, M. Metspalu and his colleagues (BMC Genetics 2004, 5:26, pp 1471-2156) discovered that the frequency of macrohaplogroup M peaks at 86% at West Bengal, indicating that Bengal serves as the Grand Central of human migration from South to East and Southeast Asia. Therefore, it is not surprising when HUGO Pan-Asian SNP Consortium, consisting of 92 scientists (Science, 2009, 326: pp 1541-1545), concluded, “the evidence from our autosomal data and the accompanying simulation studies…point toward a history that unites the Negrito and non-Negrito populations of Southeast and East Asia via a single primary wave of entry of humans into the continent.” In other words, it is not wrong to say that Bengali women are the mothers of all Southeast and East Asian population that includes the Burmese as well. As such, the entire population of South, East, and Southeast Asia is connected by the mtDNA macrohaplogroup M and all are the descendants of the Asian Negritos. This is in absolute agreement with the statements of U Kyaw Min and U San Tha Aung that the earliest people of Arakan are Negritos. Thus, there is an overwhelming agreement between science and legend supporting the Rohingya existence since the time immemorial and they are known as Raksha or Bilu (meaning dark and ugly ogre) in the Myanmar chronicles. It is excitingly so because Raksha or Bilu are the guards of Mt. Meru and the Rohingya today are concentrated in the region of Mt. Mayu, which is the physical representation of the Buddhist cosmological Mt. Meru. The Buddhists must be very grateful to the Rohingya for safeguarding their sacred mountain since the beginning of the world. Beyond doubt, with the science of modern genetics, it confirms that the Rohingya, who appears to be a modern image of our ancestral Negritos, are the aborigines of Arakan. Now, the Burmese still call the Chinese ‘paukphaw’, meaning ‘sibling’, reflecting their historical cultural lineage. I would like to suggest that the Burmese may also call a Rohingya ‘paukphaw’ because he is also a sibling in light of the anthropological genetics. Again, based on the population genetics, we also know with certainty that of the total three billion DNA nucleotides in our human genome 99.99% is the same in the entire human population. As such, we all are siblings. In the days of Arakan Kingdoms, there were slavery and discrimination, but there was no recorded communal violence or ethnic cleansing. The same is true during the days of British rule. The Rohingya problem emerged only when the British withdrew in 1947-48, and the three nation-states known as Pakistan, India and Burma were created. Many people got divided along the new border lines. The biggest example is the division of Great Bengal into lesser West Bengal and East Bengal within India and Pakistan respectively. East Bengal, in 1971 violently broke off from Pakistan to become an independent sovereign nation, Bangladesh. The smaller peoples, such as Baloch, Kashmiri, Naga, Mizo, Manipuri, Chakma, Rohingya, Rakhine, Chin, Kachin, Shan, Kaya, Karen, Mon etc., are not that fortunate. 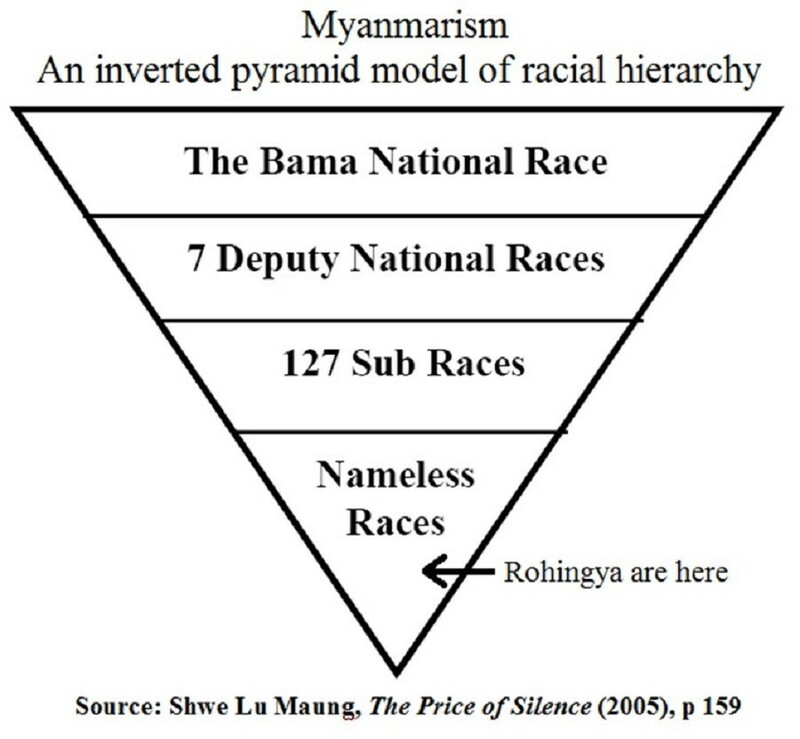 The Rohingya are the worst because they got cemented at the bottom of the Myanmar racial hierarchy, as illustrated below. The Rohingya dilemma began when their ancestral region was divided into Pakistan (now Bangladesh) and Burma, along with the midstream of Naaf River. They are agriculturists and fishermen, and still are nomadic to some extent. Their ancestral land runs along the east and west Banks of Naaf River. They were caught in the brand new nationalism and citizenship acts of Pakistan and Burma. They had no understanding of what the heck a nation-state or citizenship is in the modern civilized world. All they knew was that their freedom had been severely restricted and their villages were divided by the demarcation of a borderline running in the middle of their ancestral land. In confusion, chaos and rebellion broke out. U Nu Government of Burma settled the situation in a peaceful manner, which is well reflected in the speech of Brigadier General Aung Gyi on the 4th of July 1961 when he welcomed the end of armed insurrection of some 200 Rohingya. Aung Gyi’s speech reads as follow in my English translation from the original Burmese that appeared in the Khit-ye Sa-saung (p 31, The Rakhine State Violence, Vol. 2: The Rohingya). Then, he gave the examples of Lisu, E-kaw, La-Wa, Shan living inside Myanmar and China, and Tai, Mon, Karen inside Myanmar and Thailand. After that, he said the following. Thus, U Nu Government implemented peace and citizenship to the Rohingya. The problem was solved and ended there, in 1961. However, in 1962, most, unfortunately, General Ne Win and his army seized power, abolished all democratic institutions, and introduced militarized ultra-nationalism and racial hierarchy. With hate ideology, Myanmar’s ethnic cleansing of Rohingya has reached to a point of genocide and crimes against humanity. For long 55 years from 1962 to 2017, the civilized world did nothing. U Nu had said, “It is a sin to kill, but it is a greater sin to watch the killing with folded arms.” As long as the world remains silent with folded arms the Rohingya and their alike will be suffering in the hell of civilization. Dr. Shwe Lu Maung is an author of several books on Burma (Myanmar), and is a living authority on his native Rakhine (Arakan) state. He is a scientist by training and profession and claims to be a social Darwinist. Before settling in the United States, he spent decades living both in Burma and Bangladesh. He contributed this article to Media Monitors Network (MMN).